Vancouver’s real estate market has some pretty insane deals, most of those being the kind the average local will never be able to afford. So how about a 4-bedroom character home going for $1? 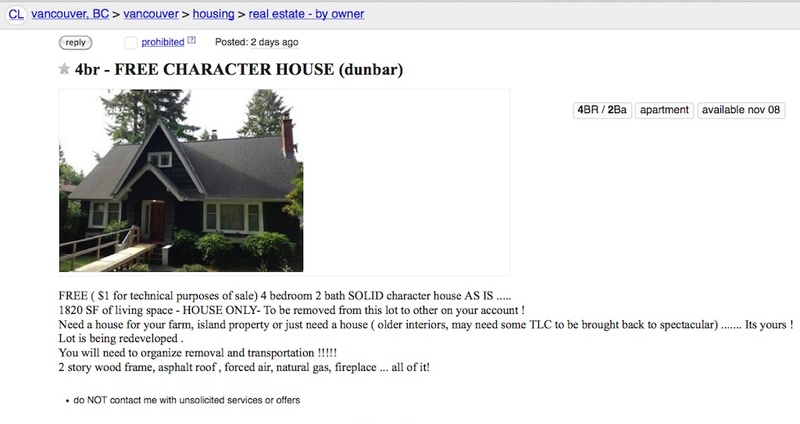 A Craigslist posting that went up this week is for a four-bedroom home located in the Dunbar area, and it’s going for the unbelievable price of…FREE. Well, the owners will have you pay $1 so it’s considered an actual sale. The hitch? Yep, it’s kind of a big one, and you can probably guess it: You’ve got to move the house off the property. The whole 1820-square-foot thing’s gotta go–all four bedrooms, two baths, and even a fireplace. Once the house is settled in its new spot, you’ll probably be doing some fixing up inside, too, per the listing’s text. Any takers?